Hey y’all! It’s Wedding Wednesday around these parts and I’m linking up with Jordon and Meredith again. 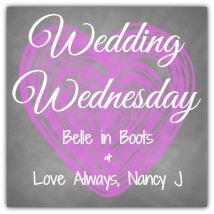 Please make sure you check out their blogs and other blogs in the linkup! Today I thought I’d share a bit about our wedding invitations. I’ll start with the bad. I ordered labels so I wouldn’t have to write out each address on the invitation and I hate them. The font is too dark and the placement of the address is off. However, I know that people will look at the envelope for probably five seconds so I’m sticking with it because in the grand scheme of things, it just isn’t that important. However, I do love our invitations. I did the same thing I did for our save the dates and ordered the design from Etsy, then had them printed. I like the theme and wanted to keep it going. 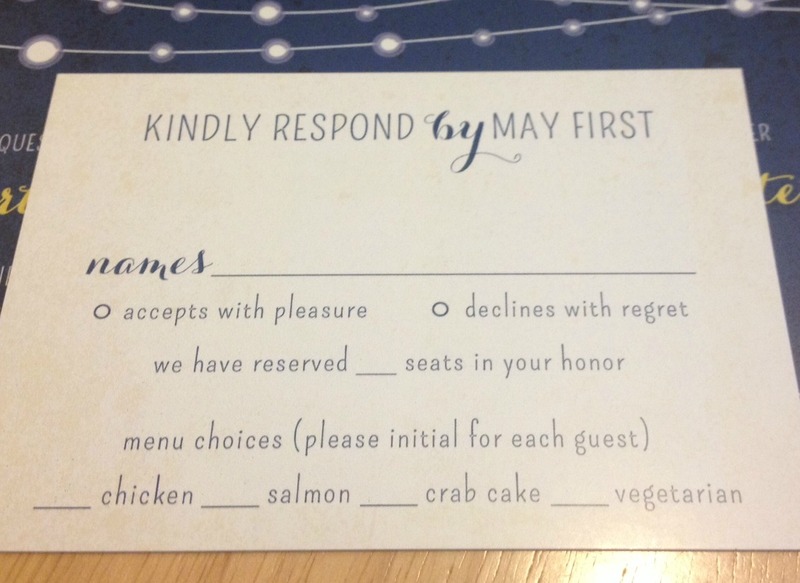 I also messed around with the RSVP card a bit and added a line where we specified exactly how many guests were invited (hoping to ward off confusion about plus ones, etc. — we’ll see!). One tip that I’m doing for the RSVP cards is numbering them and linking the number to each guest in a spread sheet — that way, if someone forgets to put their names on their card, I’ll still know who it came from. Anyway, enough yapping…here they are (with some pertinent info redacted. it feels weird to have all that out there, ya know?)! I love the pop of color with the names! And that’s a great idea about numbering them so you can track them later if needed. I think your invitations look great! Your menu looks very yummy! Loved seeing your invites! Especially considering I plan to do the same thing in regards to # of seats reserved. I commend you for sticking with your labels. I’m not sure I could have gotten past that, even though they really do not matter! Yeah, they aren’t totally awful, I just don’t like them but in the end I just can’t fret over every single thing, ya know? Stopping by from the linkup! Your invitations are adorable! I love that they’re clean & simple but still pretty & elegant! That’s definitely the look I hope to achieve when designing mine! thanks megan! i used mallory hope designs on etsy if you are interested! she was great to work with! Those are beautiful. Love them! My fiance’s mom is designing ours and the samples she has sent so far look amazing. This makes me even more excited for them. Hope all your planning is going well! that’s so awesome that you have a family member designing your invitations! such a personal touch! Oh I LOVE LOVE LOVE them!! Invitation design is one of my most favorite things and these look so beautiful! Great font choices! thanks lauren! i kinda stumbled upon this theme, k liked it and so we went with it. also, our venue has the same type of lights strung up so it all ties together (at least in my mind. i’m sure no one else will notice, lol). Ahhhh love these so much! Great choice! So romantic! 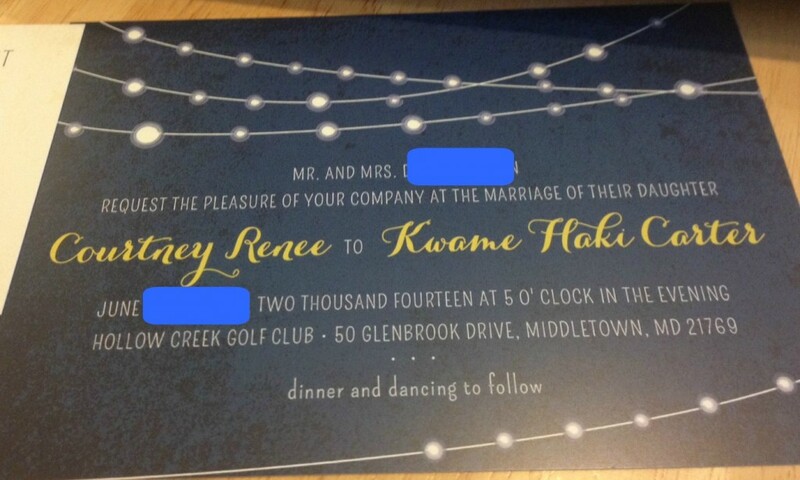 I love the light strands on the invitation. Whimsical and beautiful. Michelle @Baby Blues to Running Shoes recently posted…When does it become easy? Love them!! The numbering on the back is key, then you can send a quick, “hey are you coming” email and have a good idea of the final number. Spreadsheets are key for wedding planning. I still use my spreadsheet with addresses to this day. Also, keep a spreadsheet of gifts from people, it will make thank you notes way easier.